To start my day I toasted a Healthy Life Whole Grain English Muffin and topped it with a Poached Egg, I love Poached Eggs! Also had my morning cup of Bigelow Decaf Green Tea. Not quite as hot but the high humidity is still there! Having some yard work done today. Wish I was able to get out there and do it but sometimes you are limited in a wheel chair. I stayed in and did some housecleaning, dusting, vacuum, and such. For Dinner tonight I prepared Sweet BBQ Chicken Kabobs w/ White Rice. Came across a new item at Meijer a while back and prepared it for the first time and loved it! Tonight I’m having the Johnsonville Sweet BBQ Chicken Kabobs. Meijer has 3 different kinds but I wanted to give the Sweet BBQ Chicken Kabobs again. You can grill them or bake them, so I’m baking mine. The Kabobs come fresh and in a sealed package of 4 seasoned and skewered Kabobs. To prepare them I preheated the oven to 425°F. Placed the Kabobs on foil-lined backing pan, coated with Pam Cooking Spray. Baked for 15 minutes, turning once. And done! How easy is this, a one pan cleanup. 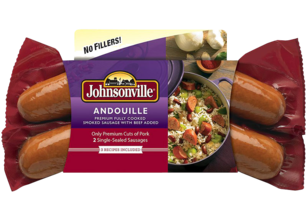 Johnsonville has it’s self another winning dish! The Chicken is moist and so tender with nice seasoning. The easiest Kabob I’ve ever prepared and one of the tastiest! Then for the a side I prepared some Uncle Ben’s White Rice. I usually have Brown Rice but the White Rice just sounded good! Easy to prepare; Just bring Water and Rice to a boil. Reduce heat and cover for 20 minutes and done! Rice is so good! Really like White Rice, just wish it was lower in the carbs. For dessert later a bowl of Del Monte Cling Peaches. We had avoided the freezing rain they had predicted but about 8:00 this morning it started getting foggy and the fog mist started freezing on the roads. Did’t last long though, we ended up getting some rain later. Not having a lot of luck with my car. Just got it back from a small hose leak and now there’s a leak on the other side of the engine, guess it happens when the car has well over 140,000 miles on it. I need a new car or good used one, and SUV type so I can get my wheelchair in and out of the car easily by myself. But it costs money, which is tough to save when your on a fixed income. Anyway I had planned a new Chicken Dish for dinner but I failed to lay the Chicken out of the freezer to thaw in the fridge overnight. Good job Mark! But no problem because I have some incredible leftovers to reheat! Tonight it’s Leftover Shrimp and Andouille Sausage Gumbo w/ Wheat Bread. This is the post from last night’s dinner on how to prepare this dish. 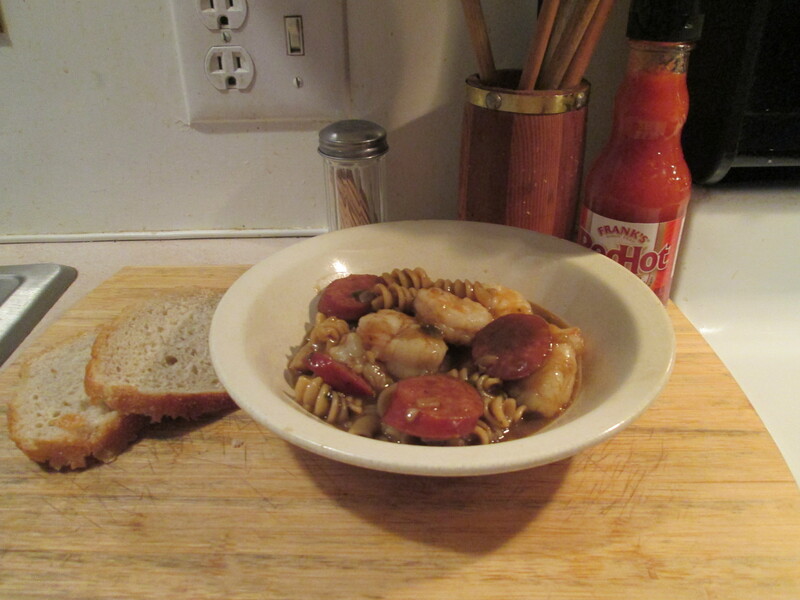 To make it I used a box of Zatarain’s Gumbo Pasta Dinner Mix for the Gumbo base, Johnsonville Andouille Sausage, and a bag of Kroger Brand Jumbo Shrimp. The Zatarain’s Gumbo Pasta Dinner Mix uses Pasta instead of Rice. Very easy to prepare, takes about 25-30 minutes. I just boil the stock that’s in the packet, sliced the Johnsonville Andouille Sausage into bite size pieces and added them to the stock along with a few shakes of Frank’s Red Hot Sauce for 10-15 minutes. Then I added Extra Large Shrimp and simmered another 3-6 minutes. And the Gumbo is ready to serve and It turned out fantastic! Nice flavor, incredible tasting stock, meaty Shrimp and Sausage, and plenty of Pasta, makes one easily prepared hearty and delicious dish. Enough leftover for my dinner tonight! I also had a slice of Klosterman Wheat Bread. For dessert later a Healthy Choice Dark Fudge Frozen Greek Yogurt. Enriched Pasta Product (Semolina (Wheat), Niacin, Iron, Thiamine Mononitrate, Riboflavin, Folic Acid), Onion, Enriched Wheat Flour (Wheat Flour, Niacin, Iron, Thiamine Mononitrate, Riboflavin, Folic Acid), Salt, Modified Corn Starch, Red & Green Bell Pepper, Spices (Including Red Pepper And Parsley), Sprouted Wheat Flour, Yeast Extract, Hydrolyzed Soy Protein, Garlic, Caramel Color, Thiamine Hydrochloride, And Sulfiting Agents. 1. HEAT oil in large skillet (12-inch) on medium-high heat. Add sausage; cook and stir 5 minutes or until lightly browned. 2. STIR in water and Pasta Dinner Mix. Bring to boil, stirring occasionally. Reduce heat to low; cover and simmer 15 minutes or until pasta is tender, stirring occasionally. 3. REMOVE from heat. Let stand 5 minutes. Sauce will thicken upon standing. Stir before serving. Chicken Gumbo: Prepare as directed, using 1 pound boneless skinless chicken breasts, cut into 1/2-inch cubes, in place of the sausage. Cook and stir 5 minutes or until chicken is no longer pink. 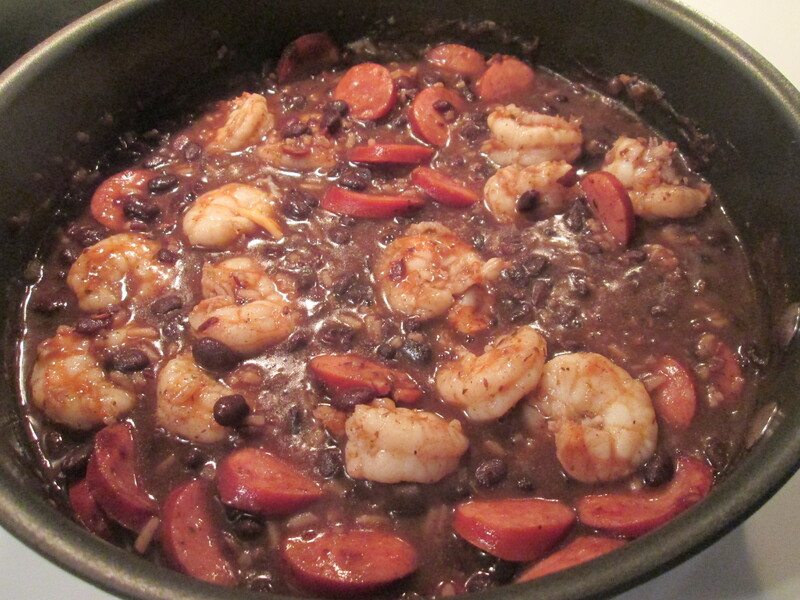 Shrimp Gumbo: Prepare as directed in Step 1, using 1 pound medium shrimp, peeled and deveined, in place of the sausage. Cook and stir 3 minutes or just until shrimp turn pink. Remove shrimp from skillet. Continue as directed, stirring shrimp back into skillet after pasta is tender. A fairly mild morning compared to what we’ve been having, about 26 with no wind. Warming up to rain they say, with freezing rain overnight. Did some house cleaning and a load of laundry for Mom while she was at Church. Settled in to watch the NFL Playoffs for the afternoon. For dinner tonight a real favorite of mine, Shrimp and Andouille Sausage Gumbo w/ Sour Dough Mini Boule. 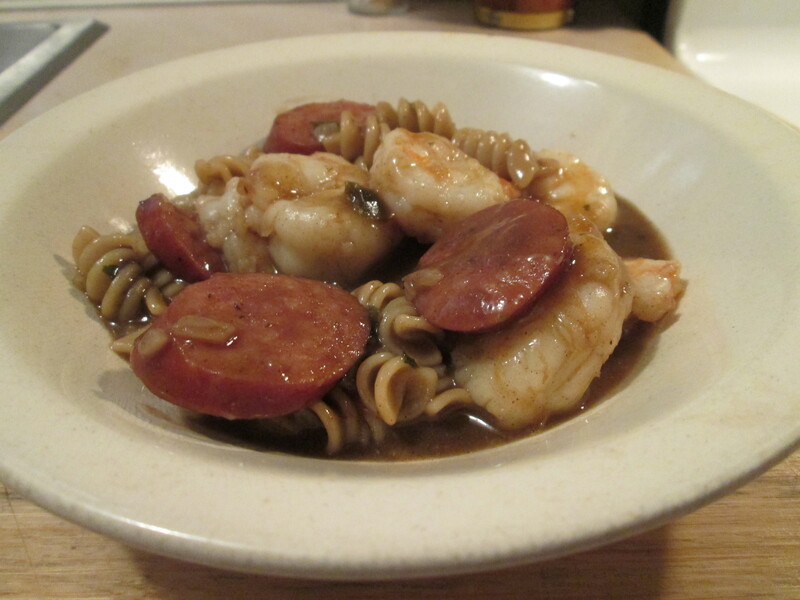 To make it I used a box of Zatarain’s Gumbo Pasta Dinner Mix for the Gumbo base, Johnsonvill e Andouille Sausage, and a bag of Kroger Brand Jumbo Shrimp. The Zatarain’s Gumbo Pasta Dinner Mix uses Pasta instead of Rice. Very easy to prepare, takes about 25-30 minutes. I just boil the stock that’s in the packet, sliced the Johnsonville Andouille Sausage into bite size pieces and added them to the stock along with a few shakes of Frank’s Red Hot Sauce for 10-15 minutes. Then I added Extra Large Shrimp and simmered another 3-6 minutes. And the Gumbo is ready to serve and It turned out fantastic! Nice flavor, incredible tasting stock, meaty Shrimp and Sausage, and plenty of Pasta, makes one easily prepared hearty and delicious dish. Enough leftovers for a couple of lunches too! I also baked the remaining Sour Dough Mini Boule to go with the Gumbo. For dessert later Breyer’s Carb Smart Vanilla Bean Ice Cream in a Waffle Bowl topped with Smucker’s Sugar Free Hot Fudge Chocolate Topping. Came across the Keebler Waffle Bowls at Kroger the other day. 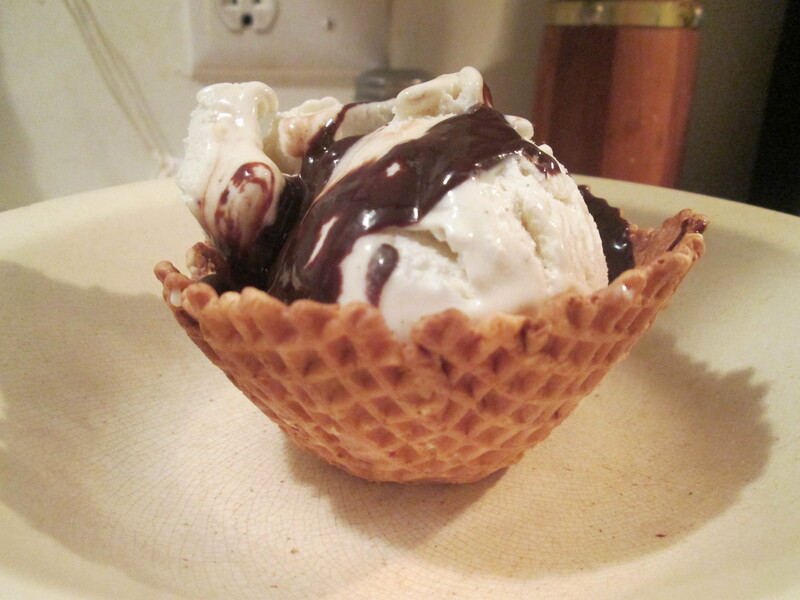 They’re Waffle Cones shaped into a bowl, you can eat the bowl as your eating the Ice Cream, love these! It was our warmest morning in quite sometime, 60 degrees. But the wind started whipping up with gusts up to 50 mph and temperatures dropping through the day into the 40’s. Had some local flooding in areas, a whole lot of rain throughout the night and early morning. Had to take the car in for some repairs. I’ve got a rattle that’s getting louder, so I’ll wait and see how much this will cost. 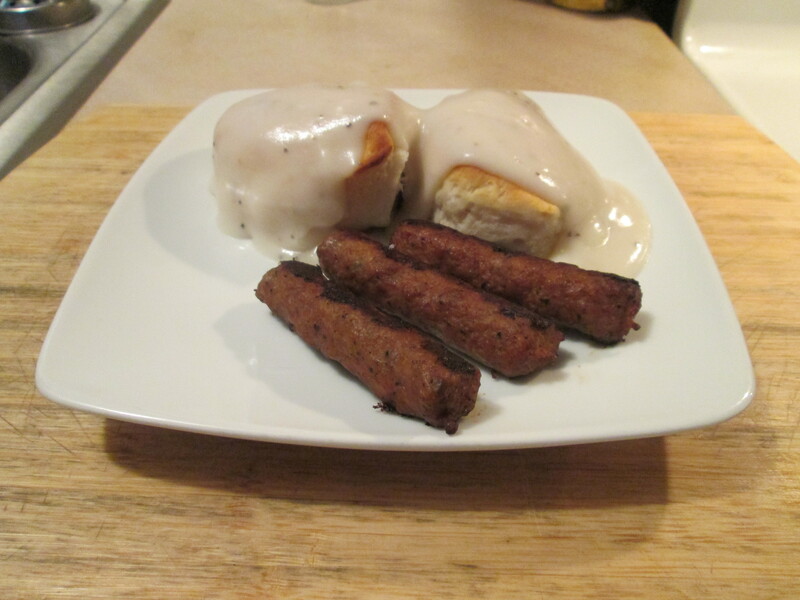 Tonight for Dinner another Breakfast, I prepared Biscuits and Gravy w/ Turkey Sausage Links. The Breakfast I had prepared for Dinner the other night was so good I thought I would whip up another Breakfast for Dinner. This time I made Biscuits and Gravy w/ Turkey Sausage Links. I used Pillsbury Grands JR. Biscuits. 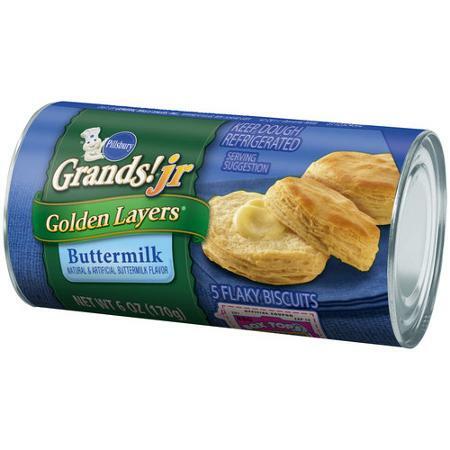 They’re about half the size of the Pillsbury Grands Biscuits, but fewer calories. To prepare them just bake them at 400 degrees for about 10 minutes and done. As the Biscuits were baking I got my other 2 items ready. I prepared a packet of Pioneer Peppered White Gravy Mix. For this, just boil 1 1/2 cups of water. Add the mix to a 1/2 cup of cold water, and mix. When the water starts boiling add your Mix and stir until it thickens up and remove from heat and serve. I topped my Biscuits with the Gravy. Now I have some Biscuits and Gravy going on! 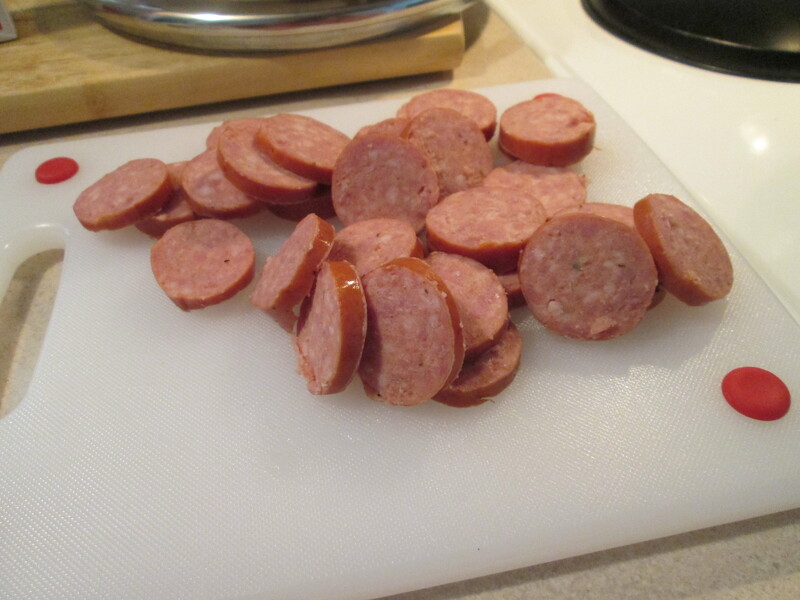 Then for a side I heated up some Johnsonville Breakfast Turkey Sausage Links. 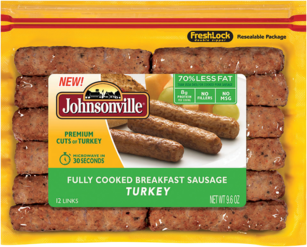 I was out of the Jennie – O Turkey Sausage Links so it was Johnsonville to the rescue! Just heat these for 8 minutes on medium high heat and they’re ready. Excellent tasting Sausage Link, as are all Johnsonville Sausages. Biscuits and Gravy with Turkey Sausage Links, Dinner is served! Starting to like this Breakfast for Dinner Menu! For dessert later a Jello Sugar Free Dark Chocolate Pudding topped with Cool Whip free. 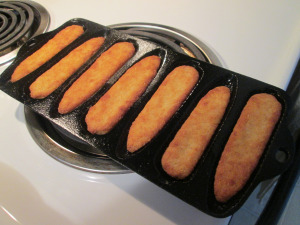 3 – Heat for 8-10 minutes over medium heat or until heated through, turning occasionally. Started my day off with an Egg Beater’s Egg White Omelet with my 3 Bean Buffalo Chili and Sargento Reduced Fat Shredded Sharp Cheddar Cheese, oh and a few shakes of Frank’s Red Hot Sauce. Love the flavor Frank’s adds to dishes. Got some laundry done and went to Kroger for Mom. 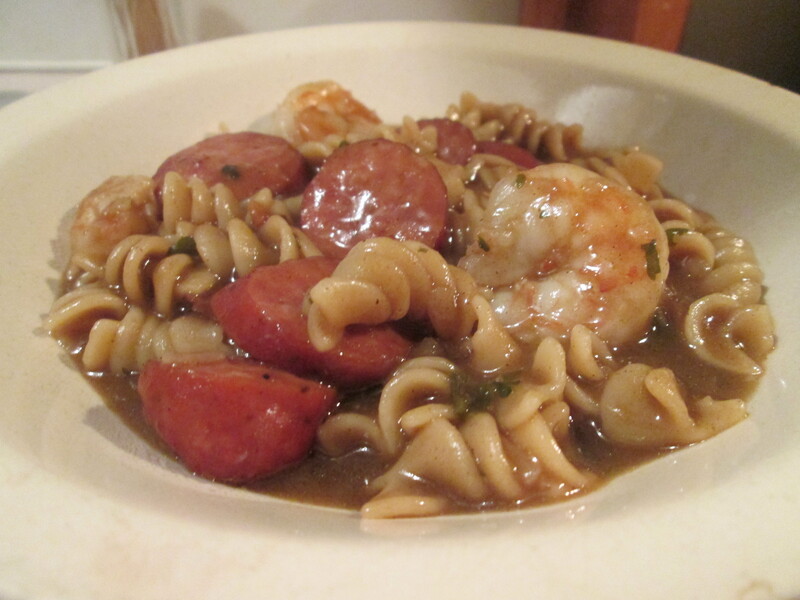 For dinner tonight it was leftovers, I reheated the Shrimp and Andouile Sausage Pasta Gumbo. No way I was going to let the Gumbo leftovers go to waste! 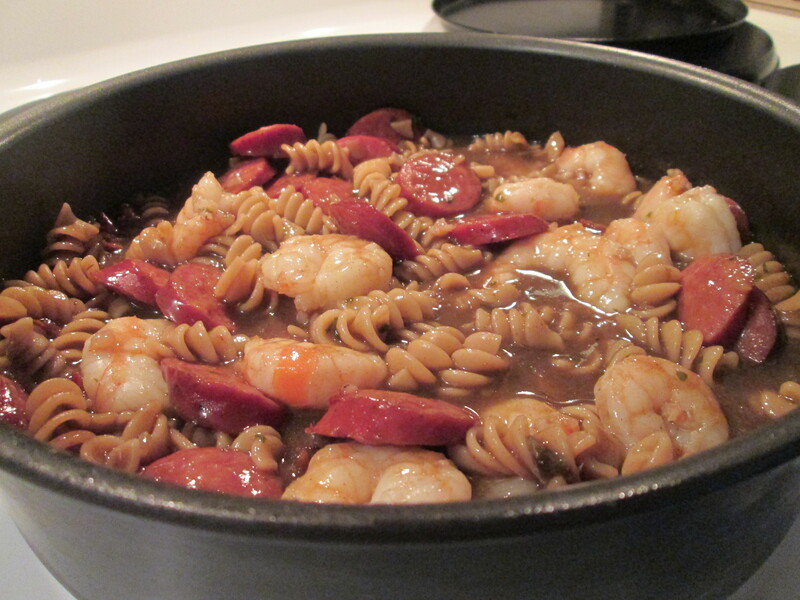 The Roux, Pasta, Shrimp, Andouille Sausage, and Spices combine to make some delicious leftovers. Just add the leftovers to a small sauce pan and reheated on medium low till heated through. It was every bit as good as it was the first time it was served. Love them leftovers! I’ve left the recipe and the original post for it below. 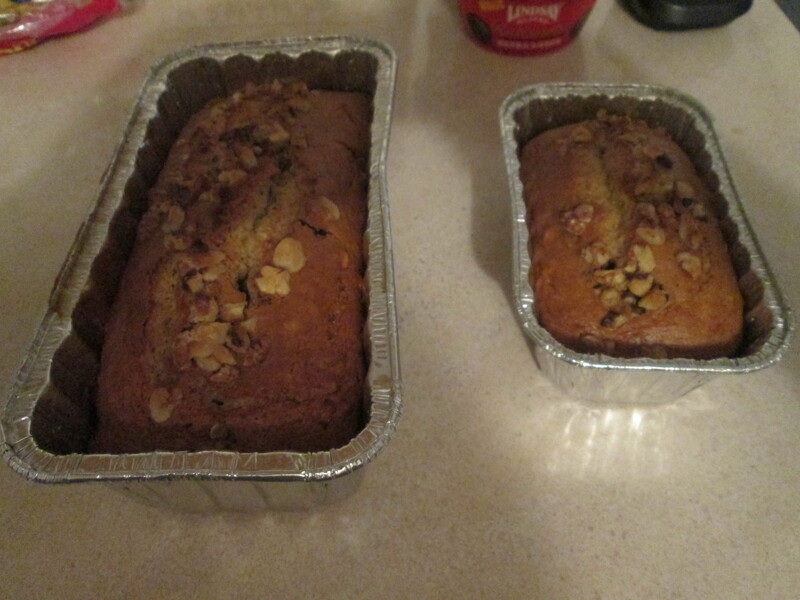 For dessert later a slice of Pillsbury Nut Bread that I had baked earlier today. I used a box of Zatarain’s Gumbo Pasta Dinner Mix for the Gumbo base. It uses Pasta instead of Rice. Very easy to prepare, takes about 25-30 minutes. I just boiled the stock that was in the packet,sliced Johnsonville Andouille Sausage and a few shakes of Frank’s Red Hot Sauce for 10-15 minutes. Then I added Extra Large Shrimp and simmered another 5-10 minutes. Said and done the Gumbo is ready to serve and It turned out fantastic! Nice flavor, incredible tasting stock, meaty Shrimp and Sausage, and plenty of Pasta, makes one easily prepared hearty and delicious dish. Beautiful day out today, started off cloudy but the sun came out and about 52 degrees. Went to Meijer early this morning, they had some good sales going on. I loaded up on Jennie – O Turkey Products and Seafood. I also grabbed a Tide Liquid Detergent for Mom and noticed something, the amount of Detergent in the bottle. It used to contain 100 ounces, now it’s 92 ounces. Same bottle size, same price, but less for your money! Just another Product disappearing act. For dinner tonight I prepared Shrimp and Andouille Sausage Gumbo w/ Cornbread Ears. I also made some Cornbread Ears. It’s normal baked Cornbread but in a cast iron baking mold in the shape of Ears of Corn. I used Martha White Corn Meal Mix. For dessert later a few Honeycrisp Apple Slices and a Dole Mini Banana. 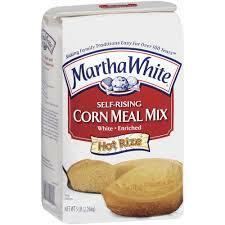 Martha White Self-Rising Corn Meal Mix. Heavy rain on and off all day and a high in the low 50’s. Got the cart out and did a little maintenance on it and cleaned it up a bit under the carport awning. Sure glad I invested in that, it gets me out and gets me to the lake if I want to go fishing, yard work and anything else I have to do outside. 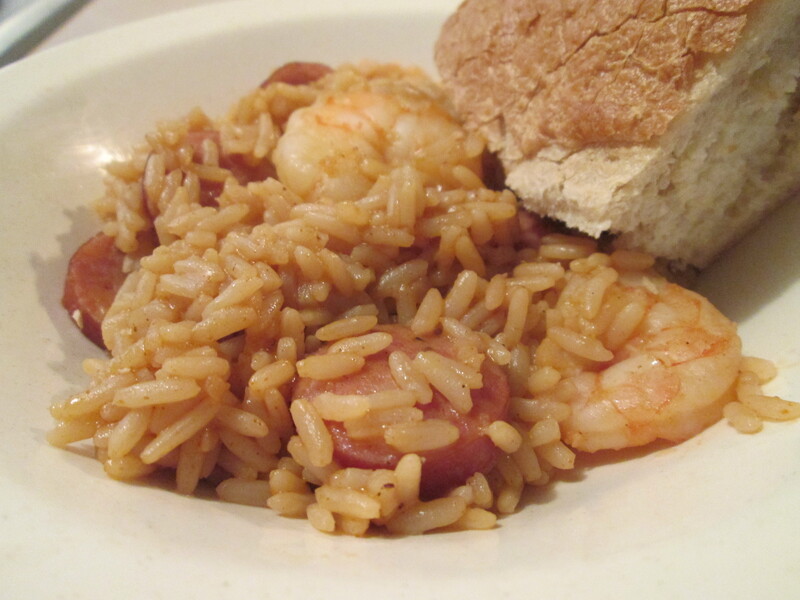 For dinner tonight it’s Shrimp and Andouille Sausage Jambalaya and Baked California Sourdough Bread, one of my favorites! 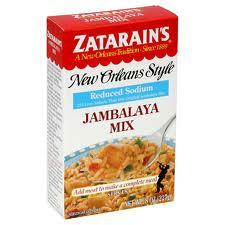 I used Zatarain’s New Orleans Style Jambalaya Mix (Reduced Sodium) for my base for the Jambalaya. I use Zatarain’s Products whenever I can, love the flavor and seasoning of all their products. To prepare it I just followed the easy instructions on the box. Mixed 2 1/2 cups of Water and 2 tablespoons of Extra Virgin Olive Oil, and brought it to a boil. Added the Zatarain’s Jambalaya Mix and my Johnsonville Andouille Smoked Sausage, I had sliced the Sausage into smaller pieces before adding. Returned it to a boil, and then reduced the heat to low. Covered and simmered for about 25 minutes till most of the moisture had been absorbed. With 10 minutes left I added my (Kroger Brand) Jumbo Shrimp, till fully cooked and turned pink. Removed it from the heat and let it rest for about 5 minutes before I served it. 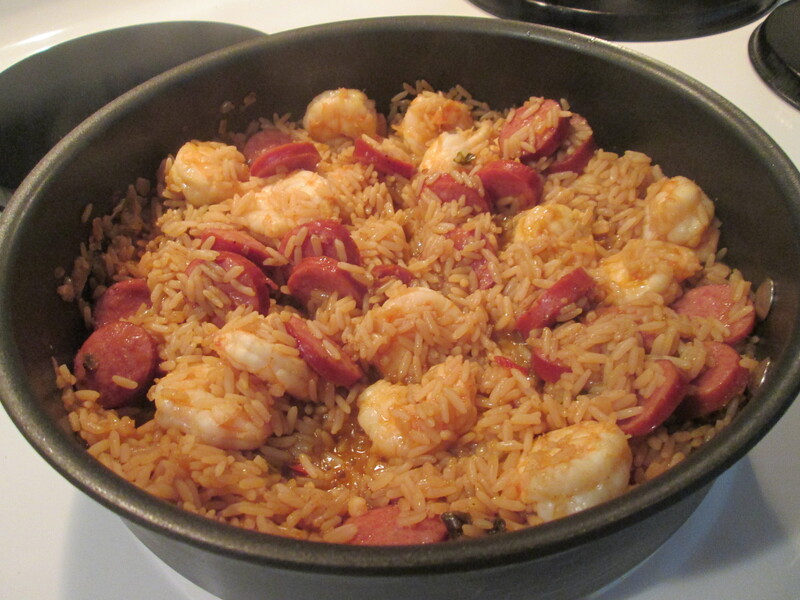 The Andouille Sausage and Jumbo Shrimp make a fantastic pairing with the Jambalaya Mix! I added a couple of shakes of Frank’s Red Hot Sauce to the mix also, nothing like a little heat to kick things up! Also baked a California Sourdough Mini Boule. This makes one delicious Jambalaya Dish. For dessert later a Healthy Choice Vanilla Bean Frozen Greek Yogurt. Authentic New Orleans flavor with 25% less sodium than the original. * This Easy-to-Prepare Dinner Mix Has Just The Right Blend of Ingredients For A Great-Tasting, Authentic New Orleans Style Meal. Zatarain’s Has Been The Leader In Authentic New Orleans Style Food Since 1889. So When You Want Great Flavor, Jazz It Up With Zatarain’s! * Zatarain’s, New Orleans, La 70114. Comments Or Questions? Call 1-877-837-3796 Or Visit Us Online At Www.Zatarain.Com For Great Recipe Ideas and Product Information. Enriched Long Grain Parboiled Rice (Iron Phosphate, Niacin, Thiamine Mononitrate and Folic Acid), Dehydrated Vegetables (Onion, Bell Pepper), Salt, Yeast Extract, Soy Sauce (100% Soybean), Dextrose, Thiamine Hydrochloride, Soybean Oil (Tbhq Added As A Preservative), Paprika, Potassium Chloride, Garlic, Spices, Monosodium Glutamate, Chili Powder, Caramel Color, Silicon Dioxide (Flow Agent). A beautiful crisp and sunny Fall morning and day here today! Spent the morning at the hospital to be with the family of my best friend. He underwent a Vascular Aneurysm surgery. A very risky surgery but he came through it in flying colors!! In fact the surgeon said it was perhaps the smoothest surgery of that type he ever did. So glad he’s like a brother to me. Came home and did a load of laundry and relaxed then. For dinner tonight it was leftover city for me! 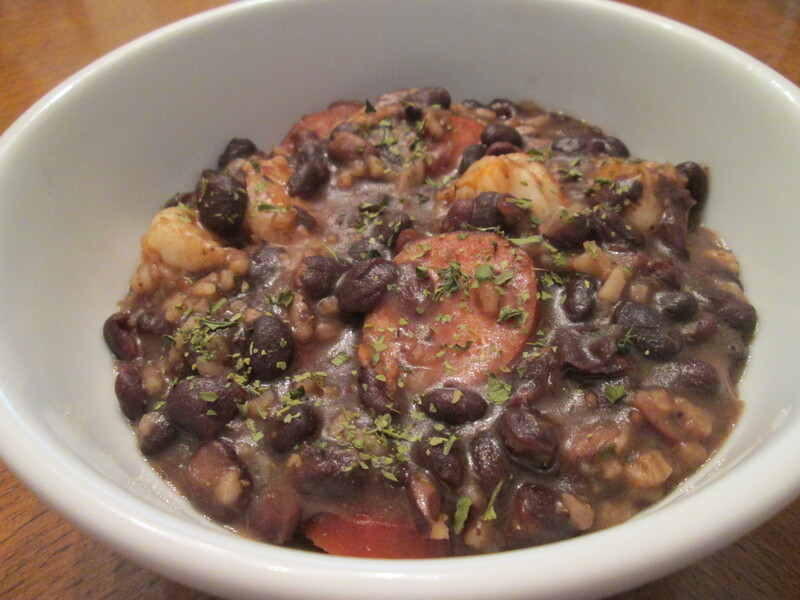 I reheated the Shrimp and Andouille Sausage w/ Grandma Maud’s Premium Black Beans and Rice. It was a long morning at the hospital so thank goodness I some delicious leftover Shrimp and Andouille Sausage w/ Grandma Maud’s Premium Black Beans and Rice to reheat. I just put the leftovers in a sauce pan and reheated it on medium low. I left the original post below on how to make this dish. To prepare the Black Beans and Rice just boil your water, add your mix, boil and simmer for about 30 minutes and your done, stirring often. After 20 minutes of cook time I added the Andouille Sausage, then after 25 minutes of cook time I added my Shrimp. Oh the aroma, that alone makes your mouth water! To serve it I used a bowl, sprinkled some Cilantro on it and a few shakes of the Frank’s Red Hot Sauce. Then Enjoy! For dessert later a Jello Sugar Free Dark Chocolate Pudding.